Moaning was pretty cool. 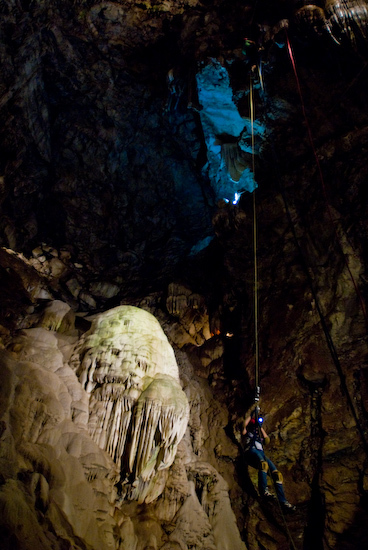 They main cavern chamber is 165 ft deep and is the largest publicly viewable cavern in California. You can rappel down to the bottom (for about $65) or walk down the stairs. Since we had my in-laws with us, we walked - otherwise, I'd have totally jumped on the rappelling opportunity. We went down 234 steps on a narrow staircase (partially steep and straight down, the rest narrow and spiraled) to descend all the way to the bottom. The staircase was built in the 1920's. They assured us it was safe. 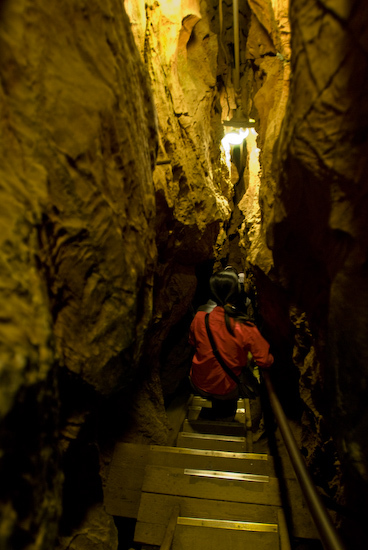 The guide explained a lot about the rock formations and how the stalactites and stalagmites grow over time. He was also entertaining and amusingly morbid (he explained how the first discoverers would enter the cavern and after a couple steps take the "seven-second tour" - the length of time it takes to fall the height of the cavern - then he showed us the LARGE COLLECTION of bones from animals, children, and adults that had fallen over the millennia through the entrance hole - nice!). We took our time at the bottom and watched a few people rappel down. Watching someone rappel down really puts a sense of scale to the vastness of the room. Pictured here are two rappellers performing the second half of their descent. 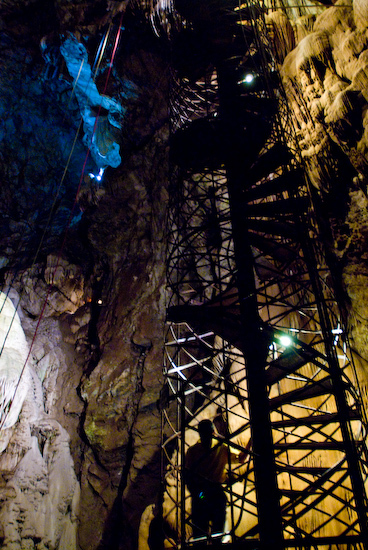 Moaning caverns also offers a 1500ft. zip line (outside of course), but we didn't do that. We then had the staff at Moaning call Black Chasm for us to see if they had their power back yet. They had just had their power restored, so we drove back to Black Chasm (another hour of driving…). Black Chasm turned out to be a much more extensive (and deeper) cavern than Moaning. It was probably over 400 ft deep (as far as we could see) but went deeper than that under a pool of water. There were tons of chambers, but only three that we could visit (but you could see into several more, each with unique formations). 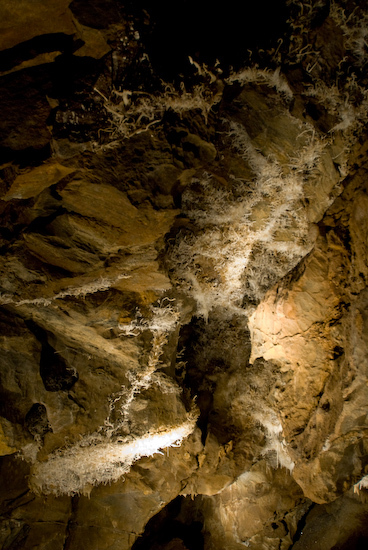 Black Chasm Cavern is probably most notable for its helictites - calcium carbonate formations that grow not upward or downward due to dripping water, but outward in small spicules that can come straight out, bend around randomly, and even curl back on itself. Black Chasm has thousands of helictites. The main chamber of Black Chasm was used as a model for the Zion cave in the second and third Matrix movies, so that was kind of cool. 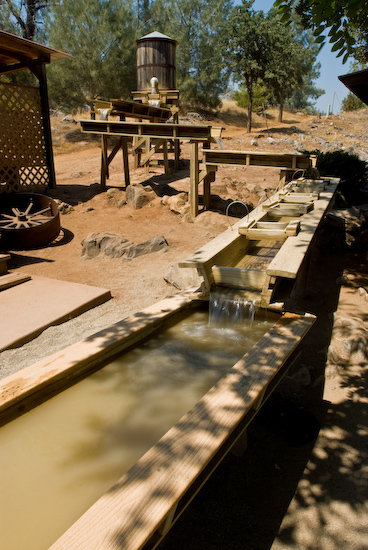 Both Black Chasm Cavern and Moaning Cavern provide a sluice so kids and family can pretend they are prospectors panning for gems (you buy a bag of gravel and dirt which has been doped with a certain amount of crystals and wash away the dirt using the sluice box). All in all, not a bad way to spend a day.